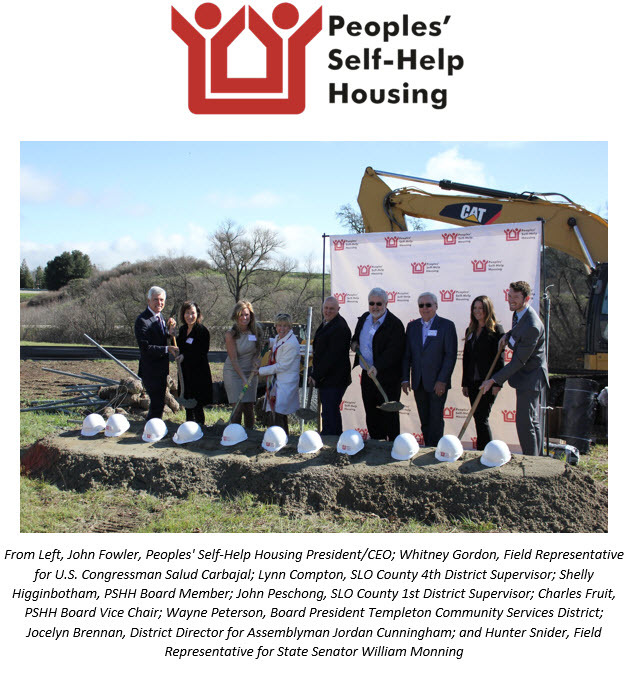 Templeton, Calif., Jan. 30, 2017— Recently, Peoples’ Self-Help Housing (PSHH) hosted a ground breaking ceremony for Rolling Hills II, a new 30-unit affordable housing development in Templeton. The ceremony took place on the 2-acre-construction site -- 1001-1009 Las Tablas Road, Templeton -- and brought together PSHH staff members, local dignitaries and residents. Once completed, Rolling Hills II will feature one- to three-bedroom units ranging from 601 to 1,082 square feet. The development will also include laundry facilities, a barbecue area and tot-lot. Future residents will be able to utilize additional community facilities at the adjacent Rolling Hills development. Rolling Hills II will serve households earning up to 60% Area Median Income, and rents will be based on 30% of tenant income. Rolling Hills II is expected to be completed in the spring of 2018. Funding partners for RH II (new phase) include the County of San Luis Obispo, CREA, LLC, the Housing Authority of the City of San Luis Obispo, the San Luis Obispo County Housing Trust Fund and Wells Fargo Bank. Development partners include Rea & Luker Architects, Civil Design Studio and landscape architect Robert Fowler.